Five of the ten female protestors arrested in China last month for protests related to sexual harassment and women’s rights are still in jail, reports the New York Times. 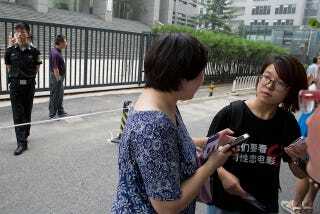 [The] five of them — core members of China’s new feminist movement — sit in jail, accused of provoking social instability. One of the women, Wu Rongrong, 30, an AIDS activist, is said to be ailing after the police withheld the medication she takes for hepatitis. Another, Wang Man, 33, a gender researcher, was said to have had a mild heart attack while in custody. The protestors’ detention has attracted international outcry, from political and human rights leaders to feminist activists who are demanding the women’s release. However, the Chinese government has virtually ignored the outrage, keeping the protestors under lock and key while they await trial. In addition to denying the women medication, the authorities failed to notify their families about the detentions, and in one instance, the police sat in on a meeting between Ms. Wei and her lawyer, Wang Qiushi.